The month of October is a great time to emphasize that children can “be the light” in a dark world. Try this pumpkin carving activity to show how God “cleans us out” (forgives our sin) and puts His light inside us (Holy Spirit) so that we can shine God’s light (to provide hope) to others who are hurting. Read Matthew 5:13-16 with your child. Show the pumpkin: People can be like pumpkins. We have skin on the outside, and so does the pumpkin. Inside of a pumpkin, there is “yucky stuff.” Let’s check it out. Carve the top to the pumpkin. Open it up and let your child look inside. There is “yucky stuff” inside this pumpkin! 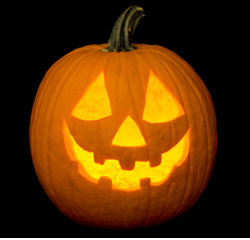 Just like the pumpkin, people have “yucky stuff” inside their hearts when they make bad choices. The Bible calls this “yucky stuff” sin. Take out the “yucky stuff”: Is there room to place a candle when this pumpkin is full of “yucky stuff?” In the same way, we must allow God to clean us out (forgive us of our sins) so that He can place His light inside of us. (Start to pull out the inside “yucky stuff.” As you pull it out, remember that God takes the “yucky stuff” [bad choices, times we are mean to others, times we disobey our families, times we lie, times we do the wrong thing when we know the right thing to do, etc.] out when we say that we’re sorry and ask for God to forgive us. Place the candle: Once the “yucky stuff,” or sin, is out, can we show light yet? Not yet. We need to have light inside. When we believe that Jesus died to take away our sins, and that he rose to give us new life, and when we choose to be Christians, God puts His light inside of us. The Holy Spirit comes to live inside of us to tell us when we’ve done wrong, done right, and to guide us in our choices. (Place the candle inside the pumpkin and light it.) He enables us to “be the light” for others. Eyes: show/act out how to treat people, watch the right things and choose to say “no” to watching/searching for the wrong things, etc. Nose: set a positive example by not gossiping (or being “nosy”), invite the left-out children to sit with you at lunch, etc. Mouth: say nice things to people, be kind with our words, avoid inappropriate language or cursing, etc. Place your pumpkin in a dark place and enjoy its light: Once the “yucky stuff” (sin) has been cleaned out, God’s light (the Holy Spirit) is inside of us. Then we start to “be the light” and people will see what we do and praise God!